I’m not sure what’s more impressive at Watershed Kitchen & Bar, the gorgeous space, the inventive menu, or the mind-boggling cocktail list. Every few months, Watershed rolls out an entirely new list of cocktails, and last month the cbusfoodbloggers sampled each and every beverage on the new survival-themed cocktail menu. Each cocktail menu rollout features unique and intriguing cocktails paired with a fun, themey menu designed by artist Greg Davis. The menus serve as a sort of choose-your-own-adventure guide and provide tasting notes and ingredients as well as a fun and interactive incentive for patrons to step outside their comfort zone and try something new. Each menu also features one charity cocktail for which a portion of the proceeds go to a local nonprofit (currently Friends of the Metro Parks). Some favorites from the Survival Cocktail Menu include the Belay On, a bitter orange bourbon beverage, the Feel Like a Nut, a rye whiskey with pistachio orgeat, egg white, and warm spices, and the Teenage Dirtbag, a bittersweet and citrusy drink complete with smoking faux cigarette. Of course, many of the cocktails feature Watershed Spirits, distilled on site at the Fifth by Northwest facility, which opened in 2010. The restaurant opened in early 2017 and is led by Executive Chef Jack Moore. When we spoke with Chef Moore, one thing that stood out to me was his no-nonsense approach to local sourcing. In his mind, farm-to-table is the “common sense” approach to running a restaurant, not a marketing ploy, and as such Watershed sources as much as possible locally. The menu is small, and features a handful of entrees plus small plates. The food can probably best be described as midwest-melting-pot-American, featuring everything from short ribs with broccoli kimchi to grilled squash paprikash. The group devoured several small plates and desserts to offset all the cocktails! Some of our favorite dishes included the Fragaria and Allium Salad with strawberries THREE ways (fresh strawberries, strawberry chips, and strawberry puree) plus grilled onions, crispy quinoa, and lemon-poppy vinaigrette. And the Properly Cooked Carrots, featuring sous vide carrots with charred onion conserva, pistachio butter, orange segments, and malted barley. Do yourself a favor, and DO NOT miss out on the fried Brussels sprouts with black pepper and honey and the roasted fingerlings with garlic, herbs, parmesan, and rosemary aioli. These simple dishes were declared standout favorites by the entire group! 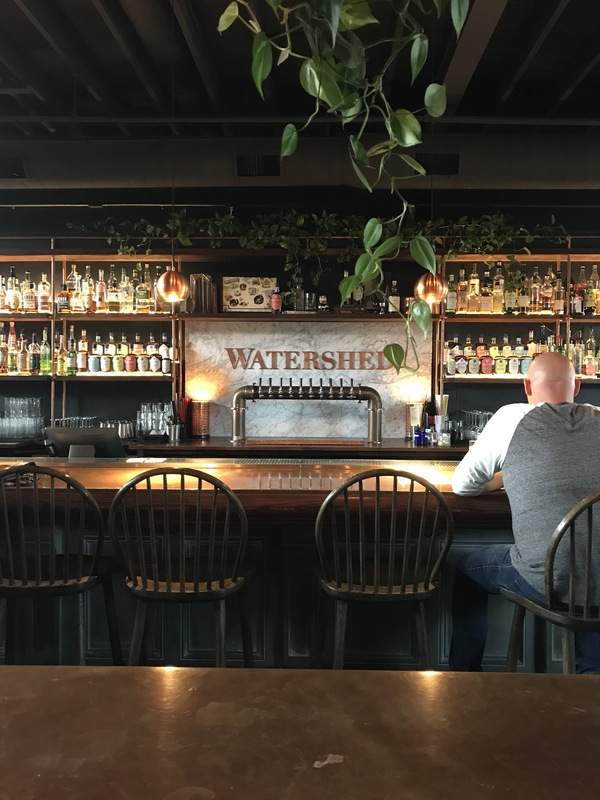 PRO TIP: Watershed offers a happy hour 4-6PM, Tuesday through Friday at the bar, and BOTH the Brussels and the fingerlings are on special (plus lots of cocktail specials too!). Okay the Teenage Dirtbag cocktail sounds hilarious with the fake cigarette, but also delicious. I’m a huge fan of carrots AND brussels, so I know what I’m trying when I come here next! Thanks for sharing all of the beautiful pictures.